With proven dependability, Cat BRASS piston pumps are utilized world-wide in thousands of applications. With proven dependability, Cat BRASS plunger pumps are utilized world-wide in thousands of applications. Cat Stainless Steel piston pumps are reliable, efficient, durable and versatile, giving users the best value for the dollar. Cat Stainless Steel Plunger Pumps successfully operate in some of the harshest in environments around the globe. 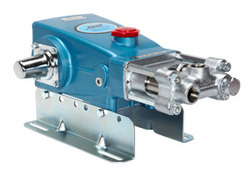 This pump has a features a high strength chrome plated brass head. Is available as a motor-pump-unit with either a 7.5 or 10 HP motor.